Classroom Activity on why did Queen Elizabeth not get married? Soon after Elizabeth became queen of England, Protestants gained full control of Parliament. It now became very important to Parliament that Elizabeth should marry and produce a Protestant heir to the throne. 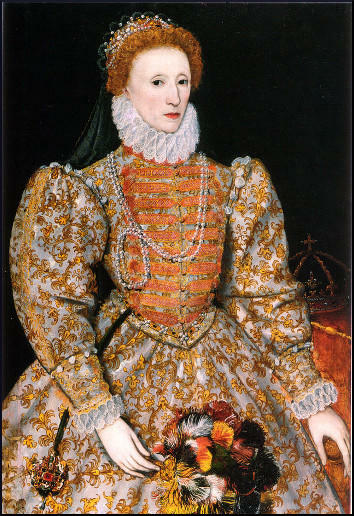 Parliament was worried that if Elizabeth died childless, Mary Stuart, a Catholic, would probably become queen of England. They feared that if that happened, all Protestants who held power under Elizabeth would be persecuted. Elizabeth had many favourites in her own court. At various times rumours circulated that Elizabeth would marry men such as Sir Charles Hatton, the Earl of Leicester or the Earl of Arundel. In October 1562 Elizabeth caught smallpox. For a while, doctors thought that Elizabeth would die. This illness made Parliament realise how dangerous the situation was. Therefore, after she recovered, they asked her once again to consider marriage. Elizabeth replied that she would think about it but she refused to make a decision. In 1566 members of Parliament tried to force Elizabeth into action by discussing the subject in the House of Lords and the House of Commons. Elizabeth was furious with Parliament for doing this. She ordered thirty members from each House to attend a meeting at Whitehall Palace. Elizabeth read out a long speech where she pointed out that whether she got married or not was something that she would decide. She added that for Parliament to decide this question was like "the feet directing the head". The members of Parliament at the meeting agreed not to mention the issue again. However, some members were unwilling to remain quiet on the subject. One politician, Peter Wentworth, claimed that members of Parliament had the right to discuss any subject they wanted. Elizabeth responded by ordering him to be sent to the Tower of London. In 1579 Elizabeth began having talks about the possibility of marrying the Duke of Anjou from France. John Stubbs wrote a pamphlet criticising the proposed marriage. Stubbs objected to the fact that the Duke of Anjou was a Catholic. He also argued that, at forty-six, Elizabeth was too old to have children and so had no need to get married. Elizabeth was furious and ordered that Stubbs and the publisher of the pamphlet should be arrested. At first Elizabeth wanted the men to be hanged, but eventually she decided that the men should have their right hands cut off. Elizabeth did not marry the Duke of Anjou. Nor did she marry anyone else. When Elizabeth died at the age of sixty-nine the Tudor dynasty came to an end. Stubbs and Page had their right hands cut off with a cleaver, driven through the wrist by the force of a mallet, upon a scaffold in the market-place at Westminster... I remember that Stubbs, after his right hand was cut off, took off his hat with his left, and said with a loud voice, "God Save the Queen"; the crowd standing about was deeply silent: either out of horror at this new punishment; or else out of sadness. Although Elizabeth was deluged with proposals of marriage from European royal houses she never married. She preferred to reign alone. And she knew how to do this as few others have done. You will never marry.... the Queen of England is too proud to suffer a commander... you think if you were married, you would only be Queen of England, and now you are king and queen both. I understand that she (Elizabeth) can not have children. (Source F) In March 1579, William Cecil, Queen Elizabeth's chief minister, reported to other members of the Privy Council. By judgement of physicians acquainted with her Majesty's body... she can have children. The investigation... proves that her Majesty to be very apt for the procreation of children. Who was the queen's husband to be, and what power was he to have over the government of the country? ... If he were a foreigner there was no knowing what power he might get over the queen, power which he would very likely use for the good of a foreign country, and not for the good of England. On the other hand, if he were an Englishman, he must be chosen from among the queen's subjects, and then it was certain that there would be jealousy and strife among all the great nobles in the country when they saw one of their number picked out and made king over them. (Source H) Queen Elizabeth, comments to Sir William Maitland in April 1561. As long as I live, I shall be Queen of England. When I am dead they shall succeed me who have the most right... I know the English people, how they always dislike the present government and have their eyes fixed upon that person who is next to succeed. Question 1. Why was it very important to Parliament that Elizabeth got married and had children? Question 3. Give as many reasons as you can why Elizabeth did not get married. Question 4. Study the list of reasons that you included in your previous answer. Do you think these reasons were of equal importance to Elizabeth? Explain your answer in as much detail as possible.